Below is the video recording and handout from this event. 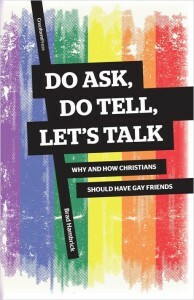 Do Ask, Do Tell, Let’s Talk: Why and How Christians Should Have Gay Friends // Brad Hambrick from The Sam James Institute on Vimeo. Do Ask, Do Tell, Let’s Talk: Why and How Christians Should Have Gay Friends // Panel Discussion from The Sam James Institute on Vimeo.